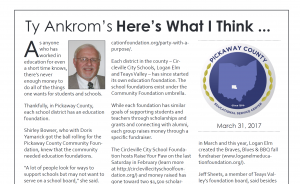 Ty Ankrom at the Pickaway County Educational Service Center highlights the four county school’s education foundations in a recent newsletter. He goes on to talk about how the Education Foundations got their start in Pickaway County. With help from Shirley Bowser and others, the Westfall Education Foundation was the first to be created in Pickaway County, in 2006. Each education foundation provides a way for the community to support students and teachers in their district. Thankfully, the Westfall Eduction Foundation has many generous supporters who have enabled us to give grants and scholarships for the past 10 years. 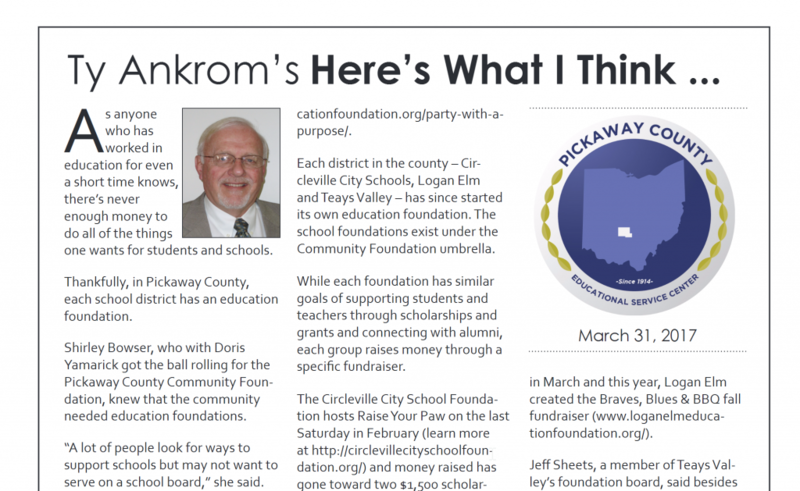 Check out the full newsletter on the Pickaway County Educational Service Center’s (ESC) website or click the link below. It is the ESC’s mission to provide services to schools and families in Pickaway County, and to facilitate the collaboration of quality services among the community agencies that serve children.